Right after college, I got the opportunity to float the Main Salmon in Idaho with a group of my closest friends, and that trip got me hooked on the river life. You spend your days swimming, fishing, and soaking in the scenery. Then at night, you get to sit around the campfire, eat gourmet food, drink all the beer you want, and stargaze on remote riverbanks. While a dose of whitewater is always fun, it can be intimidating (and dangerous) if you don’t have a lot of experience behind the oars. For those of you who are interested in getting your feet wet on the river, here’s 5 of the best river trips for beginners in the West that are packed with gorgeous scenery and plenty of flat water to get comfortable. Desert beaches, a mellow meandering river, and quintessential southern Utah canyon landscapes – that’s what you’ll get in Utah’s Labyrinth Canyon. Starting in Green River, Utah and ending at Mineral Bottom in Canyonlands National Park, three to four days are needed to cover this 68 mile section of the Green River. This easy float can be done in any kind of boat and chances are you’ll have most of the river to yourself. 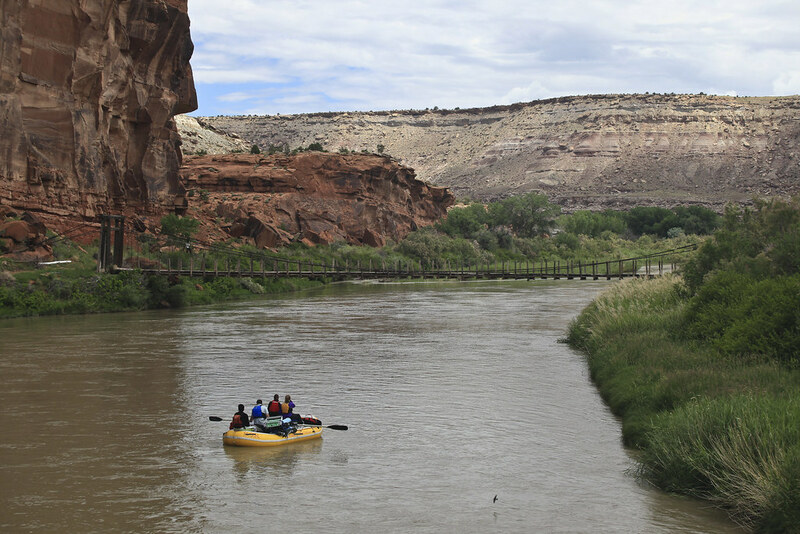 While this trip is a little logistically challenging due to car shuttles, getting a permit is easy, and there are a number of outfitters in Moab who rent boats and can help organize transportation. The Black Canyon is a 12 mile stretch of flatwater on the Colorado River just below Hoover Dam and less than an hour away from the Vegas strip. The Black Canyon can be done as a day trip, but to experience the best of this canyon, you really need to spend the night. 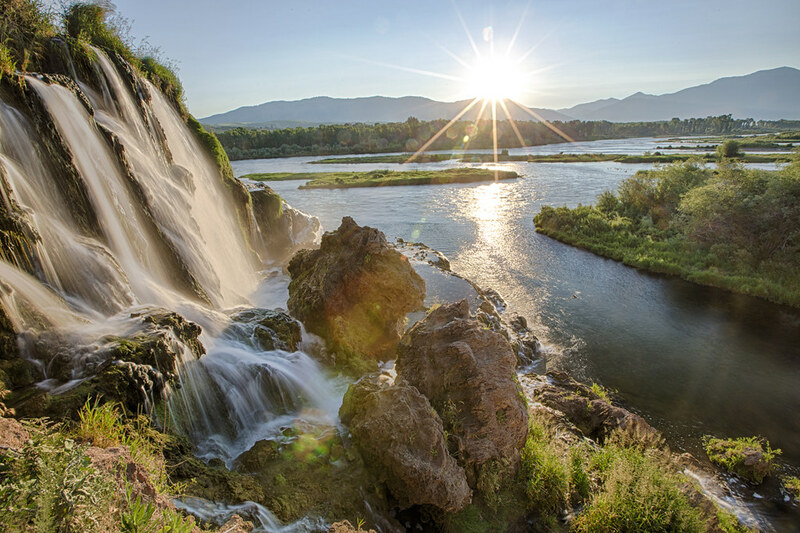 Camping is done on the sandy riverbanks, and a mere steps from your tent are some of the state’s best hot springs, including Arizona and Gold Strike Hot Springs. For more information on permits, boats, and the hot springs, visit my post A Secret Vegas Oasis: Paddling the Black Canyon. 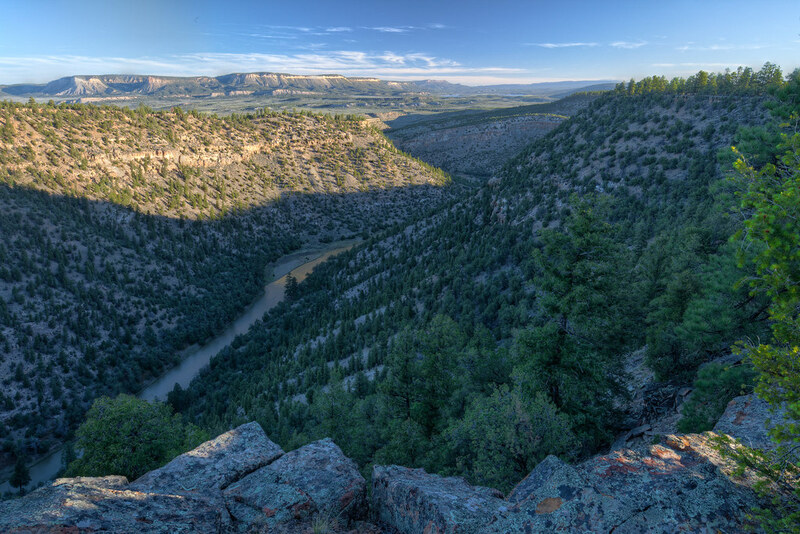 The most popular trip on Northern New Mexico’s Rio Chama River is a 31 mile section through the 1,500 foot deep Chama Canyon. Best enjoyed in an inflatable kayak over 2-3 days, the Rio Chama offers isolated beach camping among rugged sandstone cliffs, dense forests of ponderosa pine, and just enough excitement with its mild class II-III rapids. Trips begin just below the El Vado Dam, and permits are issued by the Bureau of Land Management through a competitive lottery. If you have trouble getting a permit, check out this list of outfitters that are authorized to run private trips on the Rio Chama. While the Gunnison River in Colorado is known for big water, the 26 mile section from Escalante to Whitewater through the Dominguez Canyon Wilderness is a perfect overnight trip for beginners. Featuring mild Class I and II rapids, this leisurely portion of the Lower Gunnison can be done in almost any kind of boat, including rafts and inflatable kayaks. In addition to the high-desert slickrock landscapes, the Lower Gunnison also has a number of awesome side hikes to waterfalls and petroglyphs and offers scenic riverside camping. The put-in is located 45 miles from Grand Junction, and no advanced permits are required. For more information, visit the BLM’s Lower Gunnison River website. The canyon section on the South Fork of the Snake River between the Conant Boat Ramp in Swan Valley and the Byington takeout in Heise, Idaho offers some of the best trout fishing in the country. And with soaring bald eagles, giant moose, cottonwood groves, and Idaho’s rugged mountains, a two-day, 25 mile float trip is the best way to experience it. While this section is very popular for daytime anglers, it sees very few overnight boaters, meaning you can expect solitude at the designated camping areas spread through the canyon. If you are looking for a fully outfitted trip mixed with a bit of luxury, consider a guided excursion with the South Fork Lodge. HAVE YOU EVER BEEN ON A RIVER TRIP? WHAT RIVERS WOULD YOU ADD TO THIS LIST? The Rio Chama..whoa. That looks amazing, although if apps for summer weekend trips are due before New Years, must be a popular run. Any plans to head out this summer and share the lowdown? Not sure I’ll make it down to New Mexico this summer since I just moved to Salt Lake, but I’d really love to at some point soon. I think you can probably get a permit as a cancellation too. Stay tuned! Do you have more information on the south fork of the snake? That’s super close to use here in Driggs and I totally want to run it in our canoes! Thanks! Hi Jess. I live in Driggs also and have floated the South Fork several times. There are a variety of ways to go about it. Because of the high volume of water I prefer to wait until August to float it. There is still a lot of water and the river flows swiftly but more safely than earlier in the season. It’s also usually hot enough that the water feels great and swimming is nice. Have never floated above Conant (South Fork Lodge), where the waterfalls are. Conant to Cottonwood/Fullmer can be done in a day, with a lunch spot somewhere in the canyon. Cottonwood is on the opposite side of the river and the shuttle is long, or you can pay for your vehicle to be shuttled. Conant to Byington is a really nice overnight. Shorter shuttle due to the launches being on the same side of the river. Permits are required but free, cost for overnight parking is marginal. Camping zones are plentiful though sometimes fill up, first come first serve. You can get a great river map at the link below. I prefer to camp above the Cottonwood launch in the zones on river left, in case people want to stop for the pit toilets the next morning. It is 25 miles from Conant to Byington. The river moves quickly enough however that you can cover about half of the length in half of a day. i.e. If you didn’t launch until 2 pm, you would still be able to cover 10 – 15 miles by dinner and nighttime. Most of the time you’ll be in the canyon and eventually it opens up as you approach the real world again (Byington). Trying to remember if I’ve seen canoes on the South Fork. Lots of rafts and drift boats. I prefer kayak or raft. But later in the season when it is more mellow, people float on paddleboards and I’ve even heard of people going down on their paco pads. The South Fork is certainly a bigger undertaking than the Teton River but the rewards are worth it! Stunning float. Are there rappelling opportunities in black canyon? Hi Reed, I’m not sure about that! I would do a quick Google search. Let us know if you are able to get out there and rappel some!